Please note that the inclusion of any poem or item on this page does not imply we would necessarily endorse the source from which the extract is taken; neither can we necessarily vouch for any other materials by the same authors, or any groups or ministries or websites with which they may associated, or any periodicals to which they may contribute, or the beliefs of whatever kind they may hold, or any other aspect of their work or ministry or position. "A war poet is a poet who participates in a war and writes about his experiences, or a non-combatant who writes poems about war. While the term is applied especially to those who served during World War I, the term can be applied to a poet of any nationality writing about any war ... In World War I, for the first time, a substantial number of important British poets were soldiers, writing about their experiences of war. A number of them died on the battlefield ... [others] survived but were scarred by their experiences, and this was reflected in their poetry ... Many poems by British war poets were published in newspapers and then collected in anthologies. Several of these anthologies were published during the war and were very popular, though the tone of the poetry changed as the war progressed..."
"The Muse in Arms is an anthology of British war poetry published in November 1917 during World War I. It consists of 131 poems by 52 contributors, with the poems divided into fourteen thematic sections. The poets were all from three branches of the armed services, land, sea, and air, from a range of ranks (though mostly officers) and from many parts of the UK. Twenty of the poets who contributed to this volume died during the war..."
"The strength of the war poets ... is not that they are all that representative of the opinions of the time. It would be foolish to think that poetry ought to be representative. Their strength really comes from the way that they reworked the words and thoughts of the time and rose above the immediacy of war fervour. They were blessed, if that is not too grotesque a word, with a deeply poetic and literary moment, where words rose up to lead men on to extraordinary deeds..."
"Brave soldiers in their graves revolve as EU leaders now resolve to render hard won victories to nought / On foreign soil in two world wars, they kept invaders from our shores..."
"'In Flanders fields, the poppies grow', Those famous words that we all know. But through the year and in November, Do we truly all remember?..." "On May 2, 1915, John McCrae's close friend and former student Alexis Helmer was killed by a German shell ... The next day ... as John McCrae was writing his In Flanders Fields poem, Sergeant-Major Cyril Allinson silently watched and later recalled, 'His face was very tired but clam as he wrote. He looked around from time to time, his eyes straying to Helmer's grave ... when he was done, without a word, McCrae handed the poem to Allinson. Allinson was deeply moved..."
"The poem was written in mid September 1914, a few weeks after the outbreak of the First World War. During these weeks the British Expeditionary Force had suffered casualties following its first encounter with the Imperial German Army at the Battle of Mons on 23 August ... Laurence said in 1939 that the four lines of the fourth stanza came to him first. 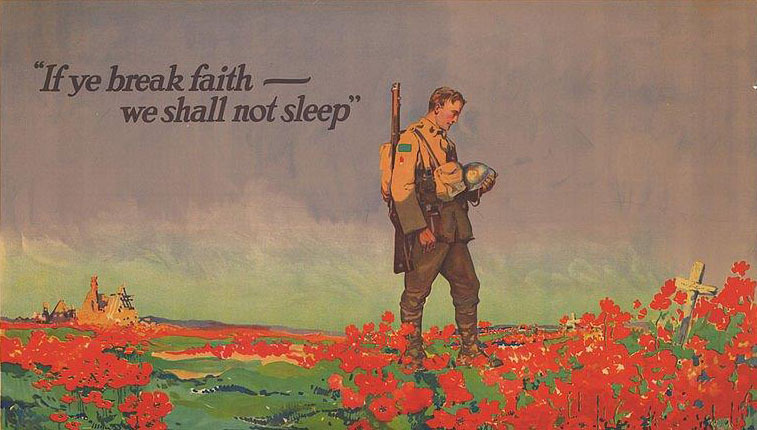 These words of the fourth stanza have become especially familiar and famous..."
"Perhaps his most famous poem, it reflects British sorrow over and pride in the young men who died in World War I. Narrated in the first person by an English soldier, the poem is sentimental, patriotic, and epitaphic. In the closing sestet, the poem's speaker suggests that his soul is eternally linked with England. The poem's familiar opening lines acquired even greater poignancy as a result of Brooke's own wartime death" [Encyclopaedia Britannica]. "They would not print Wilfred Owen's poem until after the war. Wilfred Owen died on the last day of war 1918. For me, he epitomises Soldier X" [viewer's comment at source]. "This is one of the many poems the poet Siegfried Sassoon composed in response to World War I, reflecting his own notable service in that especially bloody conflict. Sassoon was a brave and gallant upper-class officer who eventually opposed the war, but never lost his admiration for the common soldiers who had to fight it. Sassoon felt contempt for the political leaders and civilian war hawks who, safe in their power and comfort, sent young men off to die in huge battles that seemed futile and pointless ... [and] brought home to an uninformed public the true reality of the ghastly nature of the war" [source]. Readers' comments: "Very emotional and captures the horrific scenes" / "These war poems make one remember those who served ... and those who need to be honoured by us" / "This poem is going to haunt me for a long time. Powerful. Heartbreaking. Wise. And it hurts in that way that truth has of hurting" / "Raw and emotional, this poem really hits home, and shows the brutal and vicious cycle that is war" / "First hand account of the futility of war"
"'Tommy' is such a powerful poem with its context percolating through decades at a stretch. At one point, you feel that little knot tighten up in your throat and your mind knows how true the words are. The people, the government, they promise a better lifestyle for the soldiers, but in reality, they didn't even receive extra rations. But Tommy is not a fool..." [source]. Poems: England, My England by William Ernest Henley, and The Soldier by Rupert Brooke. "In the early dawn the Bishop's men / Shivered in the damp / But the shiver came not from the cold / And spread throughout the camp / The trembling horses sensed the fear / Of silent thoughtful men / Who prayed that wives and families / Might see them once again..."
"Well how do you do, Private William McBride / Do you mind if I sit here down by your grave side? / A rest for awhile in the warm summer sun / I've been walking all day and I'm nearly done / And I see by your gravestone that you were only nineteen / When you joined the glorious fallen in nineteen-sixteen..."
We need you all or our country will fall. Unbearably worse than they could possibly converse. or hold their sweetheart's hand. Who would never again shake their father's hand, or tell jokes by the firelight. Red poppies dance in the breeze. You giggle and snarl like a degenerate child, thrilled with the commotion of which you have riled. But know this and listen, the roads where you stand were built and created with those great male hands. The device which you use to spread all your lies would not even be possible without their death cries. You cuddle up tight in your soft warm bed; those men slept in trenches where they suffered and bled. You dwell in an ivory tower shielded by comfortable things, yet you have no knowledge of suffering or the real pain it brings. Those seats you sit upon up mighty and high are built on the cemeteries of the dead - since for you they did die. Those graves you dance upon in your frenzy of hate are the graves of those who gave you all you had - and your reply? Men who gasped for breath as their bodies tormented with pain, died like this for you so you would never feel the same. Not only did they build everything you see, they sacrificed their lives, for you, and for me. What sacrifice do you make? What thanks do you give? To acknowledge these men who died just so that you and I could live? You suffer with an ailment, a poison of mind, that even a mere' thank you' you just cannot find. "He paused again, collecting his thoughts. 'I never thought I'd say it, but looking back, the ones that died were the lucky ones. They didn't live to see the great betrayal that was to follow, to see the wasting of all their efforts. We couldn't have made it a land less fit for heroes to live in if we'd tried, and to be honest I can't say I care what happens anymore...'"
"Men fight for liberty and win it with hard knocks. Their children, brought up easy, let it slip away again, poor fools. And their grandchildren are once more slaves." "[T]he foe of which John McCrae wrote were not the people in the opposite trenches. and yes, we will have to bear the consequences in the years to come..."